Like many fashion designers, Issey Miyake also has a line of perfumes. 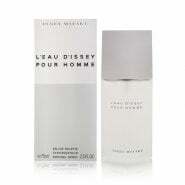 His first fragrance, the light aquatic-floral L'eau d'Issey for women, was launched in 1992. 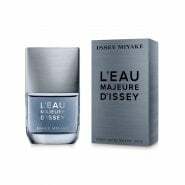 The name L'eau d'Issey (engl. : Issey's water) is a pun. In French, it sounds identical to "l'odyssée" (engl. odyssey).The bottle, designed by Miyake himself, is based on the view of the moon behind the Eiffel Tower from his Paris apartment. The scent was followed by L'eau d'Issey Pour Homme (for men) in 1994. L'eau Bleue d'Issey Pour Homme was introduced in 2004; and its evolution, L'eau Bleue d'Issey Eau Fraiche was introduced in 2006. Every year since 2007, Issey Miyake has brought out a "limited time only" fragrance for ladies in which he brings in a "guest" perfumer. In 2007, he launched 'Drop on a Petal', and in 2008 he launched 'Reflections in a Drop'. 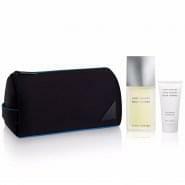 A new Issey Miyake men's fragrance, L'eau d'Issey Pour Homme Intense, was introduced at Nordstrom in the United States in June 2007, with a larger worldwide rollout following in September 2007. 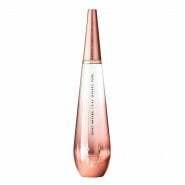 Issey Miyake fragrances are produced under a long-term agreement by the Beauté Prestige International division of Shiseido, who also produces fragrances for Narciso Rodriguez, John Varvatos, and Jean-Paul Gaultier.